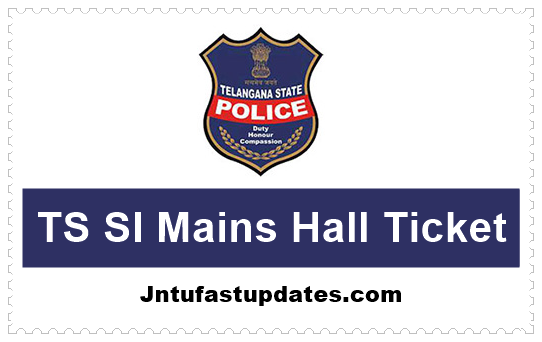 TS SI Mains Hall Ticket 2019: The Telangana State Level Police Recruitment Board has released the Sub-Inspector Mains Hall Ticket 2019 at tslprb.in. To attend for this Mains examination, applicants must have to download the TS Police SI mains Hall tickets/Admit Card from the TSLPRB official portal, tslprb.in. Candidates appearing the test have to carry the admit cards/hall tickets without fail. Otherwise, they will be restricted to enter the examination hall. Candidates have to download Telangana Police SI hall ticket and preserve it safe to carry it to the examination. Check more details such as Telangana Police SI Admit card release date, guidelines and other details from the following. Telangana SI Hall Ticket 2019 For Mains: Telangana State Level Police Recruitment Board (TSLPRB) has announced the notification for 1271 Sub-inspector posts recently. The department has released the notification on 31st May. TS Police SI application process was started from 9th June and lasted till 30th June. 1,88,715 Applicants who applied for the Posts of SCT SI Civil and / or equivalent will be administered the Preliminary Written Test on 26th August from 10 am to 1 pm and mains exam on 20th & 21st April, 2019. The TS Police Department is going to shortlist the aspirants by conducting the few tests such as physical eligibility test, physical standards test, written test (Preliminary and Mains), and interview rounds. Candidates clearing all these rounds will be essentially taken into consideration for appointment. Candidates applied for the TS Sub Inspector posts need to appear for the written test on scheduled dates. Candidates have to download TS Police SI hall ticket to appear for the test. Telangana State Police Recruitment Board is expected to release the TSLPRB SI admit cards before 10 days of the examination (tentatively). Aspirants applied for the posts of Sub-Inspector have to download the TSLPRB SI Hall Ticket as a must to attend the examination. Initially, the preliminary examination will be held for the aspirants. And candidates those have cleared with the preliminary examination will be sent to the mains examination. All the eligible Candidates for the recruitment to the Posts of SCT SI (Civil) and/or equivalent are informed that the Hall Tickets for Final Written Examination (FWE) can be downloaded from 8 am on 15th April onwards till 12 midnight on 18 th April 2019 by logging into their respective accounts on the TSLPRB website: www.tslprb.in by entering their credentials. All the eligible Candidates for the recruitment to the Posts of SCT SI IT & C and SCT ASI FPB are informed that the Hall Tickets for Final Written Examination (FWE) can be downloaded from 8 am on 15th April onwards till 12 midnight on 18 th April 2019 by logging into their respective accounts on the TSLPRB website: www.tslprb.in by entering their credentials. Candidates whose Hall Tickets could not be downloaded may send e-mail to support@tslprb.in or contact us on 93937 11110 or 93910 05006. Hall Ticket must be preserved by the Candidate till the final conclusion of the process of Recruitment. After downloading the Hall Tickets, Candidates shall take a printout of the same, preferably on A4 size paper on both the sides (so that the Hall Ticket is available on a single sheet paper). Once the printout is taken, each Candidate has to affix (with gum / adhesive – do not use staples / pins) his / her passport photograph (whose digital copy was earlier uploaded along with the Application Form) at the designated place provided in the left-bottom area of the first page of the Hall Ticket, without fail. Hall Ticket without the passport photograph affixed as described above will not be accepted on the days of Final Written Examination and Admission to Examination shall be denied to such Candidates who come to the Examination Centres without proper Hall Tickets. Note: 1. Mere issue of Hall Ticket to the Candidate does not imply that his / her Candidature has been finally cleared by the TSLPRB. TSLPRB will take up verification of the eligibility conditions with reference to the original documents for those Candidates who are declared qualified in Final Written Examination. Candidates must note that their admission to the Tests / Exams is purely Provisional. 2. This Hall Ticket is valid only if the combined image of the Candidate’s photograph and signature is legible (Taking of Print-Out on both sides of A4 sized paper on a Laser Printer is highly recommended). Further, a copy of the Candidate’s passport photo has to be fastened at the designated place. Otherwise, Hall Ticket will not be accepted and Admission to Examination will be denied. Hall ticket shall be produced at the entrance of the Test Centre and also in the Examination Hall, failing which the Candidates will not be allowed to write the Test. How To Download TS SI Mains Hall Ticket 2019 Online? 1.2 How To Download TS SI Mains Hall Ticket 2019 Online? SIR I HAVE LOST MY SI AND CONSTABLE HALL TICKETS HOW TO DOWNLOAD IT AGAIN…. PLEASE GIVE A SUGGESTION TO ME.. I lost my SI hall ticket. How to download it again? I forgot my password and more over I lost my mobile number. I have just taken new SIM card on existing number till not activated. Please suggest me as early as possible in order to get my hall ticket.